Elastic Load Balancing reports metrics to CloudWatch only when requests are flowing through the load balancer. If there are requests flowing through the load balancer, Elastic Load Balancing measures and sends its metrics in 60-second intervals. If there are no requests flowing through the load balancer or no data for a metric, the metric is not reported. Number of healthy and unhealthy instances registered with the load balancer. Number of requests completed or connections made during the specified interval (1 or 5 minutes). Time elapsed, in seconds, after the request leaves the load balancer until the headers of the response are received. Total number of requests that are pending routing. Load balancer queues a request if it is unable to establish a connection with a healthy instance in order to route the request. Maximum size of the queue is 1,024. Additional requests are rejected when the queue is full. Most useful statistic is max, because it represents the peak of queued requests. Most useful statistic is sum. Elastic Load Balancing provides access logs that capture detailed information about all requests sent to your load balancer. Each log contains information such as the time the request was received, the client’s IP address, latencies, request paths, and server responses. CloudTrail stores the information as log files in an Amazon S3 bucket that you specify. A customer needs to capture all client connection information from their load balancer every five minutes. The company wants to use this data for analyzing traffic patterns and troubleshooting their applications. Which of the following options meets the customer requirements? Enable AWS CloudTrail for the load balancer. Enable access logs on the load balancer. Install the Amazon CloudWatch Logs agent on the load balancer. Elastic Load Balancing allows the incoming traffic to be distributed automatically across multiple healthy EC2 instances. ELB helps to being transparent and increases the application availability by allowing addition or removal of multiple EC2 instances across one or more availability zones, without disrupting the overall flow of information. can also serve as the first line of defense against attacks on network. Elastic Load Balancer, by default, routes each request independently to the registered instance with the smallest load. If an EC2 instance fails, ELB automatically reroutes the traffic to the remaining running healthy EC2 instances. If a failed EC2 instance is restored, Elastic Load Balancing restores the traffic to that instance. As the traffic profile changes, the controller service scales the load balancers to handle more requests, scaling equally in all AZs. ELB increases its capacity by utilizing either larger resources (scale up – resources with higher performance characteristics) or more individual resources (scale out). AWS would need the information for the start, end dates and the expected request rate per second with the total size of request/response. When scaled, Elastic Load Balancing service will update the Domain Name System (DNS) record of the load balancer so that the new resources have their respective IP addresses registered in DNS. By default, ELB will return multiple IP addresses when clients perform a DNS resolution, with the records being randomly ordered on each DNS resolution request. Elastic Load Balancing allows subnets to be added and creates a load balancer node in each of the Availability Zone where the subnet resides. Each Subnet must have a CIDR block with at least a /27 bitmask and has at least 8 free IP addresses, which ELB uses to establish connections with the back-end instances. For HTTPS load balancer, Elastic Load Balancing uses an Secure Socket Layer (SSL) negotiation configuration, known as a security policy, to negotiate SSL connections between a client and the load balancer. SSL protocols use several SSL ciphers to encrypt data over the Internet. Elastic Load Balancing supports the Server Order Preference option for negotiating connections between a client and a load balancer. During the SSL connection negotiation process, this allows the load balancer to control and select the first cipher in its list that is in the client’s list of ciphers instead of the default behavior of checking matching first cipher in client’s list with server’s list. Elastic Load Balancer allows using a Predefined Security Policies or creating a Custom Security Policy for specific needs. If none is specified, ELB selects the latest Predefined Security Policy. Load balancer performs health checks on all registered instances, whether the instance is in a healthy state or an unhealthy state. Load balancer performs health checks to discover the availability of the EC2 instances, the load balancer periodically sends pings, attempts connections, or sends request to health check the EC2 instances. Load balancer sends a request to each registered instance at the Ping Protocol, Ping Port and Ping Path every HealthCheck Interval seconds. It waits for the instance to respond within the Response Timeout period. If the health checks exceed the Unhealthy Threshold for consecutive failed responses, the load balancer takes the instance out of service. When the health checks exceed the Healthy Threshold for consecutive successful responses, the load balancer puts the instance back in service. Listeners are configured with a protocol and a port for front-end (client to load balancer) connections, and a protocol and a port for back-end (load balancer to back-end instance) connections. A X.509 certificate is required for HTTPS or SSL connections and load balancer uses the certificate to terminate the connection and then decrypt requests from clients before sending them to the back-end instances. If you want to use SSL, but don’t want to terminate the connection on the load balancer, use TCP for connections from the client to the load balancer, use the SSL protocol for connections from the load balancer to the back-end application, and deploy certificates on the back-end instances handling requests. If you use an HTTPS/SSL connection for your back end, you can enable authentication on the back-end instance. This authentication can be used to ensure that back-end instances accept only encrypted communication, and to ensure that the back-end instance has the correct certificates. For each request that a client makes through a load balancer, it maintains two connections, for each client request, one connection with the client and the other connection is to the back-end instance. For lengthy operations, such as file uploads, the idle timeout setting for the connections should be adjusted to ensure that lengthy operations have time to complete. As the Elastic Load Balancer intercepts the traffic between the client and the back end servers, the back end server does not know the IP address, Protocol and the Port used between the Client and the Load balancer. X-Forwarded-For request header to help back end servers identify the IP address of a client when you use an HTTP or HTTPS load balancer. X-Forwarded-Port request header to help back end servers identify the port that an HTTP or HTTPS load balancer uses to connect to the client. ELB provides Proxy Protocol support to help back end servers track the same when using non-HTTP protocol or when using HTTPS and not terminating the SSL connection on the load balancer. Proxy Protocol is an Internet protocol used to carry connection information from the source requesting the connection to the destination for which the connection was requested. Cross-zone load balancer reduces the need to maintain equivalent numbers of back-end instances in each Availability Zone, and improves application’s ability to handle the loss of one or more back-end instances. It is still recommended to maintain approximately equivalent numbers of instances in each Availability Zone for higher fault tolerance. Connection draining can help the load balancer to complete the in-flight requests made while keeping the existing connections open, and preventing any new requests being sent to the instances that are de-registering or unhealthy. Connection draining allows you to specify a maximum time (between 1 and 3,600 seconds and default 300 seconds) to keep the connections alive before reporting the instance as de-registered. Maximum timeout limit does not apply to connections to unhealthy instances. If the instances are part of an Auto Scaling group and connection draining is enabled for your load balancer, Auto Scaling waits for the in-flight requests to complete, or for the maximum timeout to expire, before terminating instances due to a scaling event or health check replacement. ELB can be configured to use sticky session feature (also called session affinity) which enables it to bind a user’s session to an instance and ensures all requests are sent to the same instance. Stickiness remains for a period of time which can be controlled by the application’s session cookie, if one exists, or through cookie, named AWSELB, created through Elastic Load balancer. Sticky sessions for ELB are disabled, by default. SSL traffic should be terminated on the ELB. ELB does session stickiness on a HTTP/HTTPS listener is by utilizing an HTTP cookie. If SSL traffic is not terminated on the ELB and is terminated on the back-end instance, the ELB has no visibility into the HTTP headers and therefore can not set or read any of the HTTP headers being passed back and forth. At least one healthy instance in each Availability Zone. Duration-Based Session Stickiness is maintained by ELB using a special cookie created to track the instance for each request to each listener. When the load balancer receives a request, it first checks to see if this cookie is present in the request. If so, the request is sent to the instance specified in the cookie. If there is no cookie, the ELB chooses an instance based on the existing load balancing algorithm and a cookie is inserted into the response for binding subsequent requests from the same user to that instance. Stickiness policy configuration defines a cookie expiration, which establishes the duration of validity for each cookie. The cookie is automatically updated after its duration expires. Load balancer uses a special cookie only to associate the session with the instance that handled the initial request, but follows the lifetime of the application cookie specified in the policy configuration. Load balancer only inserts a new stickiness cookie if the application response includes a new application cookie. The load balancer stickiness cookie does not update with each request. If the application cookie is explicitly removed or expires, the session stops being sticky until a new application cookie is issued. If an instance fails or becomes unhealthy, the load balancer stops routing request to that instance, instead chooses a new healthy instance based on the existing load balancing algorithm. The load balancer treats the session as now “stuck” to the new healthy instance, and continues routing requests to that instance even if the failed instance comes back. A user has configured an HTTPS listener on an ELB. The user has not configured any security policy which can help to negotiate SSL between the client and ELB. What will ELB do in this scenario? A user has configured ELB with SSL using a security policy for secure negotiation between the client and load balancer. Which of the below mentioned security policies is supported by ELB? A user has configured ELB with SSL using a security policy for secure negotiation between the client and load balancer. Which of the below mentioned SSL protocols is not supported by the security policy? A user has configured ELB with a TCP listener at ELB as well as on the back-end instances. The user wants to enable a proxy protocol to capture the source and destination IP information in the header. Which of the below mentioned statements helps the user understand a proxy protocol with TCP configuration? A user has enabled session stickiness with ELB. The user does not want ELB to manage the cookie; instead he wants the application to manage the cookie. What will happen when the server instance, which is bound to a cookie, crashes? A user has created an ELB with Auto Scaling. Which of the below mentioned offerings from ELB helps the user to stop sending new requests traffic from the load balancer to the EC2 instance when the instance is being deregistered while continuing in-flight requests? When using an Elastic Load Balancer to serve traffic to web servers, which one of the following is true? A user has configured Elastic Load Balancing by enabling a Secure Socket Layer (SSL) negotiation configuration known as a Security Policy. Which of the below mentioned options is not part of this secure policy while negotiating the SSL connection between the user and the client? A user has created an ELB with the availability zone us-east-1. The user wants to add more zones to ELB to achieve High Availability. How can the user add more zones to the existing ELB? A user has launched an ELB which has 5 instances registered with it. The user deletes the ELB by mistake. What will happen to the instances? A Sys-admin has created a shopping cart application and hosted it on EC2. The EC2 instances are running behind ELB. The admin wants to ensure that the end user request will always go to the EC2 instance where the user session has been created. How can the admin configure this? A user has setup connection draining with ELB to allow in-flight requests to continue while the instance is being deregistered through Auto Scaling. If the user has not specified the draining time, how long will ELB allow inflight requests traffic to continue? A customer has a web application that uses cookie Based sessions to track logged in users. It is deployed on AWS using ELB and Auto Scaling. The customer observes that when load increases Auto Scaling launches new Instances but the load on the existing Instances does not decrease, causing all existing users to have a sluggish experience. Which two answer choices independently describe a behavior that could be the cause of the sluggish user experience? A customer has an online store that uses the cookie-based sessions to track logged-in customers. It is deployed on AWS using ELB and autoscaling. When the load increases, Auto scaling automatically launches new web servers, but the load on the web servers do not decrease. This causes the customers a poor experience. What could be causing the issue ? You are designing a multi-platform web application for AWS. The application will run on EC2 instances and will be accessed from PCs, tablets and smart phones. Supported accessing platforms are Windows, MACOS, IOS and Android. Separate sticky session and SSL certificate setups are required for different platform types. Which of the following describes the most cost effective and performance efficient architecture setup? Setup a hybrid architecture to handle session state and SSL certificates on-prem and separate EC2 Instance groups running web applications for different platform types running in a VPC. Set up one ELB for all platforms to distribute load among multiple instance under it. Each EC2 instance implements all functionality for a particular platform. Set up two ELBs. The first ELB handles SSL certificates for all platforms and the second ELB handles session stickiness for all platforms for each ELB run separate EC2 instance groups to handle the web application for each platform. You are migrating a legacy client-server application to AWS. The application responds to a specific DNS domain (e.g. www.example.com) and has a 2-tier architecture, with multiple application servers and a database server. Remote clients use TCP to connect to the application servers. The application servers need to know the IP address of the clients in order to function properly and are currently taking that information from the TCP socket. A Multi-AZ RDS MySQL instance will be used for the database. During the migration you can change the application code but you have to file a change request. How would you implement the architecture on AWS in order to maximize scalability and high availability? File a change request to Implement Cross-Zone support in the application. Use an ELB with a TCP Listener and Cross-Zone Load Balancing enabled, two application servers in different AZs. File a change request to implement Latency Based Routing support in the application. Use Route 53 with Latency Based Routing enabled to distribute load on two application servers in different AZs. File a change request to implement Alias Resource support in the application Use Route 53 Alias Resource Record to distribute load on two application servers in different AZs. A user has created an ELB with three instances. How many security groups will ELB create by default? Check the service limits in Trusted Advisor and adjust as necessary so the forecasted count remains within limits. Which of the following features ensures even distribution of traffic to Amazon EC2 instances in multiple Availability Zones registered with a load balancer? Your web application front end consists of multiple EC2 instances behind an Elastic Load Balancer. You configured ELB to perform health checks on these EC2 instances, if an instance fails to pass health checks, which statement will be true? The instance gets quarantined by the ELB for root cause analysis. You have a web application running on six Amazon EC2 instances, consuming about 45% of resources on each instance. You are using auto-scaling to make sure that six instances are running at all times. The number of requests this application processes is consistent and does not experience spikes. The application is critical to your business and you want high availability at all times. You want the load to be distributed evenly between all instances. You also want to use the same Amazon Machine Image (AMI) for all instances. Which of the following architectural choices should you make? Deploy 3 EC2 instances in one availability zone and 3 in another availability zone and use Amazon Elastic Load Balancer. Use SSL termination with a SAN SSL certificate on the load balancer, Amazon EC2 with all Amazon EBS volumes using Amazon EBS encryption, and Amazon S3 with server-side encryption with customer-managed keys. Use TCP load balancing on the load balancer, SSL termination on the Amazon EC2 instances, OS-level disk encryption on the Amazon EBS volumes, and Amazon S3 with server-side encryption. Use SSL termination on the load balancer, an SSL listener on the Amazon EC2 instances, Amazon EBS encryption on EBS volumes containing PHI, and Amazon S3 with server-side encryption. Launch and run the load-tester Amazon EC2 instance from us-east-1 instead. Configure Elastic Load Balancing session stickiness to use the app-specific session cookie. Configure Elastic Load Balancing and Auto Scaling to distribute across us-west-2a and us-west-2b. To serve Web traffic for a popular product your chief financial officer and IT director have purchased 10 m1.large heavy utilization Reserved Instances (RIs) evenly spread across two availability zones: Route 53 is used to deliver the traffic to an Elastic Load Balancer (ELB). After several months, the product grows even more popular and you need additional capacity As a result, your company purchases two c3.2xlarge medium utilization RIs You register the two c3.2xlarge instances with your ELB and quickly find that the ml large instances are at 100% of capacity and the c3.2xlarge instances have significant capacity that’s unused Which option is the most cost effective and uses EC2 capacity most effectively? Which header received at the EC2 instance identifies the port used by the client while requesting ELB? A user has configured ELB with two instances running in separate AZs of the same region? Which of the below mentioned statements is true? A user is configuring the HTTPS protocol on a front end ELB and the SSL protocol for the back-end listener in ELB. What will ELB do? An ELB is diverting traffic across 5 instances. One of the instances was unhealthy only for 20 minutes. What will happen after 20 minutes when the instance becomes healthy? 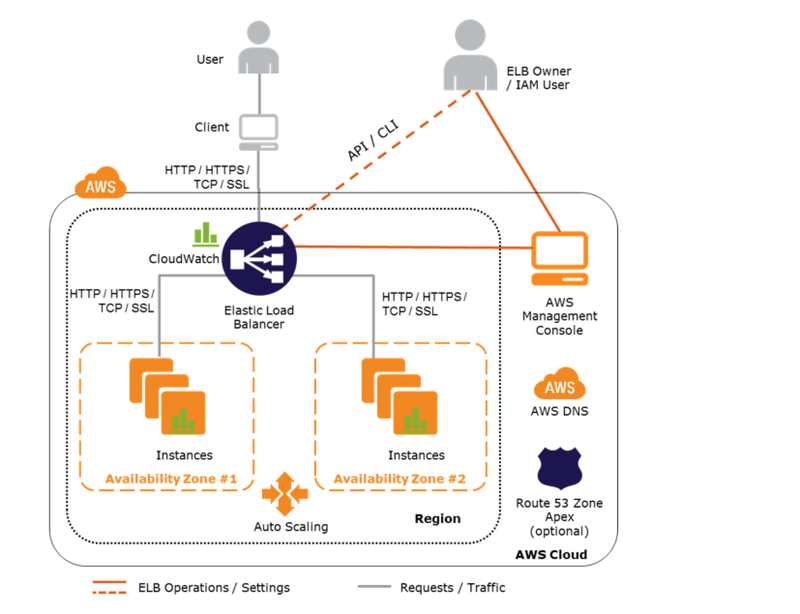 A user has hosted a website on AWS and uses ELB to load balance the multiple instances. The user application does not have any cookie management. How can the user bind the session of the requestor with a particular instance? A user has configured a website and launched it using the Apache web server on port 80. The user is using ELB with the EC2 instances for Load Balancing. What should the user do to ensure that the EC2 instances accept requests only from ELB? AWS Elastic Load Balancer supports SSL termination. User has launched five instances with ELB. How can the user add the sixth EC2 instance to ELB? The user can add the sixth instance on the fly. The user must stop the ELB and add the sixth instance. The user can add the instance and change the ELB config file. The ELB can only have a maximum of five instances.